After much procrastination, my husband and I decided to bite the bullet and buy a new mattress. After some sticker shock (gone are the days to get a new mattress for $900), we shopped and bought. Like two kids at a candy store, we couldn’t wait until the new “gift” arrived and couldn’t wait to get a good night’s rest. The time was 9:42 p.m.
At 10:45 p.m., hubby tapped me on my shoulder and said, “There are a few things this mattress could be used for – a slab for an AC unit, an archery target, or a wall for a bunker.” We both agreed the mattress was way too hard for any human and it had to go. Next day hubby heads back to the store to pick out a more comfortable mattress. Apparently, comfort costs more, so we spent even more money to find some rest. Once again, mattress arrives and, with great apprehension, we climb (literally) into bed. Like angels floating on clouds, we slept well. This experience taught me a lot about finding rest. I was reading about the 33 Chilean miners who were trapped beneath two thousand feet of solid rock. These men were desperate, not knowing if they would survive another day or be entombed by the collapse of the mine. They survived by eating two spoonfuls of tuna, a sip of milk, and a morsel of peaches — every other day. This lasted for 60 days with each one of those miners praying that someone would save them. On October 13, 2010, those 33 men emerged, each with a different story, but all reaching the same decision – they needed help and knew Who to go to. They waited and trusted and found some rest until that rescue capsule came, and they all climbed in. 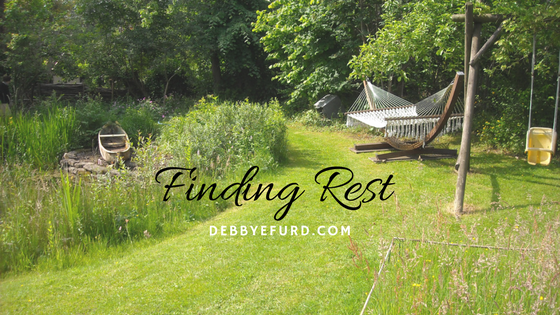 Today I’m going to stretch myself out in the hammock of grace and rest. Great thoughts, Debby. Thanks for sharing.